Just like DJI Assistant 2 does, NLD will let you both upgrade and downgrade your firmware. However, unlike Assistant 2, you can downgrade to any version that we have in our library! Connect your drone to your PC and fire up NLD and Assistant 2. Click on Firmware Manager and you will find the relevant firmware files on the list in the middle of the page. Click on the firmware you want to apply by clicking on the Downgrade, Upgrade or Re-flash options. The flashing process will then begin and it will take around 5-15 minutes depending how many versions you are jumping at once. NOTE: It is always a good idea to flash the drone twice as a verification takes place the second time around. The second flash should take less than 5 mins. And for the remote controller, how can i dwgrade/upgrade? How do I update my batteries? I've managed to get the NLD GO4 app to work and be patched and all, but for the life of me... How do I update all my batteries? 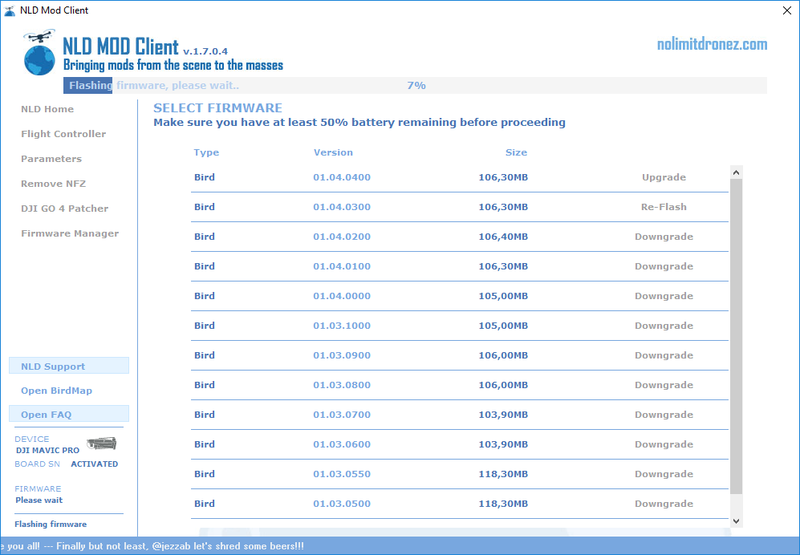 When flashing/downgrading/upgrading your mavick, the battery in place will be directly updated accordingly. If you have other batteries, you will need to connect your Mavic with battery to update to DJI assistant. Then a pop up message will appear saying that some incompatibilites with firmware have been founded. Then you will to say ok and adjust. Please follow below trend. It worked nice for me. Note that you probably need to update/downgrade your RC firm accordingly also. All instructions on below trend.